Be the first to get your order in for an E60 M5 Replica Front Bumper and turn your BMW E60 non M into an aggressive M5! Note: Bumper will not fit your factory 5-series fog lights, if you want fog lights select one of the options in the dropdown menus. Looking for a new aggressive style for your E60 BMW but with a classic BMW look? Try our E60 M5 Replica Front Bumper! It is constructed out of the same material your OEM bumper is, called Polypropylene, having light weight and ridged characteristics. This E60 M5 Replica Front Bumper comes with all the necessary hardware for installation as well as the option of two projector fog lights. 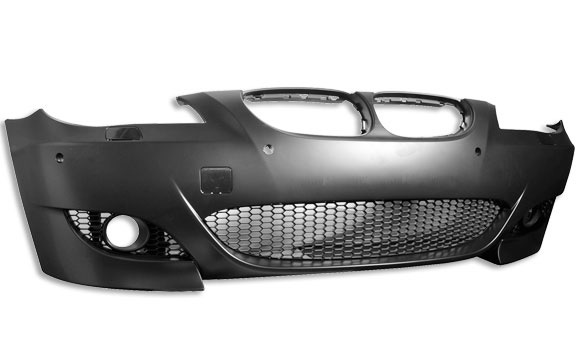 Be the first to get your order in for an E60 M5 Replica Front Bumper and turn your BMW E60 non M into an aggressive M5. NOTE: The E60 M5 Replica Front Bumper gives you an option of projector fog lights. 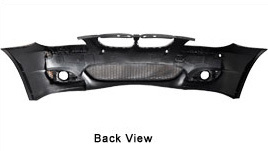 This E60 M5 Bumper is made out of Polypropylene a OEM material and includes the grille and fog lights. NOTE: PDC Pre-Drilled holes are all 18mm. They do not fit Pre-LCI. PDC pre-drilled holes will not fit factory M-Tech PDC Sensors.